All About Carrot Seed Oil! 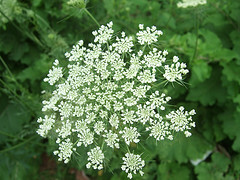 Carrot seed oil is known as Queen Anne's Lace, Bishop's Lace, Wild Carrot or Bird's Nest. It's extracted, by steam distillation, from the dried seeds of the carrot plant, Daucus Carota. This flowering plant grows up to one meter tall. It's native to Europe, Asia, North America and Australia. Its oil has various colors: yellow, amber, orange or brown. It has a woody, earthy, sweet aroma and light consistency. It differs from Carrot Oil. It's extracted from seeds while Carrot Oil is an infusion of carrot flesh into a base oil. Carrots contain carotenoids, a class of antioxidants in fruits and vegetables. Antioxidants protect from damaging UV rays, environmental pollutants and harmful free radicals. They help skin maintain a youthful appearance. Carrot Seed Oil is one of the most used oils to improve complexion. It removes toxic build-up, strengthens red blood cells, stimulates skin cell growth and removes excess water build-up from skin tissue. It has benefits of vitamins A, B, C, D and E. It's rich with antioxidants, nutrients and beta-carotene! Those with dry skin, oily skin, eczema, psoriasis, dermatitis, rashes, scars, sun damage and pre-mature aged skin, (fine lines, wriggles, age spots), can all benefit! Its detoxifying properties are effective for Rheumatism and arthritis, too! A therapeutic grade of oil is used for aromatherapy. Its earthy scented vapor combats stress, exhaustion, boosts the liver, digestive and respiratory systems. Carrot seed blends well with: cedarwood, frankincense, geranium, lavender, rosewood and spicy essential oils. For extended life, store in a dark, glass jar in cool and dry place. It can last for 2 to 3 years! A few drops in your soap recipe is plenty. Use a soap with powerful antioxidants and nutrients! Pregnant women and epileptics should avoid using carrot seed oil. As with any essential oils there are cautions to heed. Essential oils are bioactive ingredients. This means they contain natural chemicals that interact with biological systems. They're potent chemicals and should be used with care. Never use large amounts of essential oils externally or internally. Never use them straight. They must always be diluted in carrier oil, or soap, lotion, or other buffering agent. Finally, never use them without knowing what their bioactive compounds are known to do. Can't find what you're looking for? Find a list of soap making oil, now!